Well – last night the weather was so foul that there was no chance of my getting out – torrential rain and gales saw to that. This morning the world is completely different – it’s still and there’s bright sunshine. The forecast for tonight is not good though – another storm system is coming through, so it’s looking as though it’ll be tomorrow before I get out again. Well, tonight has made up for yesterday’s blank – Paul started things off by shooting a wily old dog fox that had eluded him for ages. We’ve been putting bait out for it on his farm for a few weeks, and although he’d seen it several times, he couldn’t get near it. Tonight, however, it came in while he was sitting waiting for it in his observation tower. A .22-250 round ended the issue. We then went about ten miles up the road to a dairy farm, where I called in the biggest dog fox I’ve seen for a very long time. I’ve not weighed it yet, but will do so in the morning. I plan to have it mounted, so it’s currently in my chiller. We then tried calling in two different places without luck. Just as we were about to call it a night though, two dog foxes that were presumably having a bit of a territorial dispute ran across the field in front of us. It was Paul’s turn to shoot, so he dropped the first one, then spotted the second and dropped that one too. That brings our total to 13 foxes for the first 12 days of November, so we’re keeping with our target figure of an average of one a day. We tried to exploit a window between two rain systems that came through the south-west this evening. In spite of calling, however, we saw no foxes before we had to beat a hasty retreat when the second front hit suddenly. 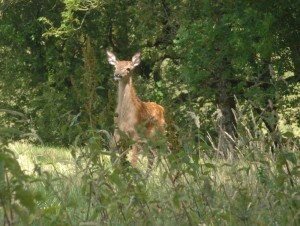 We did see three roe deer though, which was nice! Sadly, it’s currently raining and blowing an absolute storm, so there’s not a cat in hell’s chance of any shooting tonight. I did take Rufus out for his first taste of game shooting earlier today though – Alan, a local farmer invited us to join in for a day on the pheasants. I kept Rufus on a lead for the morning, then, after lunch, let him have free rein while it was my team’s turn to flush and beat. Even though he’s still too young to be acting as a full-on gun dog, he was excellent, and partly because I’d already taken some time to get him used to the sound of gunshots, he didn’t bat an eyelid when I, or anyone else, fired nearby. He’s currently curled up sleeping off the day’s exertions – I plan to do the same shortly! Paul and I visited a farm on the edge of Exmoor this evening. Due to the bad weather last week we’d slipped behind in our numbers – we really need to be averaging one a day until the end of December to equal last year’s numbers, and we’d only accounted for six since the start of the month. I’m pleased to say that we shot three this evening, so we’re back on target. Paul and I split up when we got out of the truck – he went off in one direction, while I headed in the other. As I was setting up I could hear his caller going, and not long after I heard a shot immediately followed by a thump. One down, I thought – it turned out to be a big dog fox. I then called in and shot a vixen. We both did our best to increase the tally, but without luck. By then the moon was lighting the landscape up, so it was nigh-on impossible to move without being seen. We worked our way back to where I’d parked next to the farmyard, but before unloading all our kit, I whispered that it was always worth checking the field below. At first, there was nothing there, but about a minute later an unlucky fox came through the hedge and started heading up towards the geese. The big vixen didn’t make it more than a few yards before a .204 round stopped her in her tracks. The farmer was delighted, and said that he’d sort out all the details for us to try and catch up with some wild boar that have been causing a real problem on some ground he rents. Fingers crossed that at least one of them ends up in my freezer! My shooting partner, Paul, and I just got back from a blank session. It doesn’t happen very often, because we’re very persistent, but in spite of covering a lot of ground and calling in several places, all we saw were bunnies and a few roe deer. The temperature was higher than it was a few days ago, and the moon was so bright it was like being on stage. I think the former dampened any mating behaviour, and the latter kept pretty well everything vulpine in the undergrowth. We didn’t hear a single call all evening, whereas earlier in the week the foxes were shouting all over the place. Still – the farmer’s happy because he hardly ever sees a fox these days! b) It will be linked to by other websites which have strict policies about such things. It might seem paradoxical to some people that I love natural history while at the same time I shoot certain animals. To anyone who understands the countryside, however, there is no confusion. If you want hedgehogs, dormice, skylarks, hares, and so on, you need to control the predators. If we simply ‘left nature to sort itself out’, we’d just end up with grass and foxes. And then just grass. 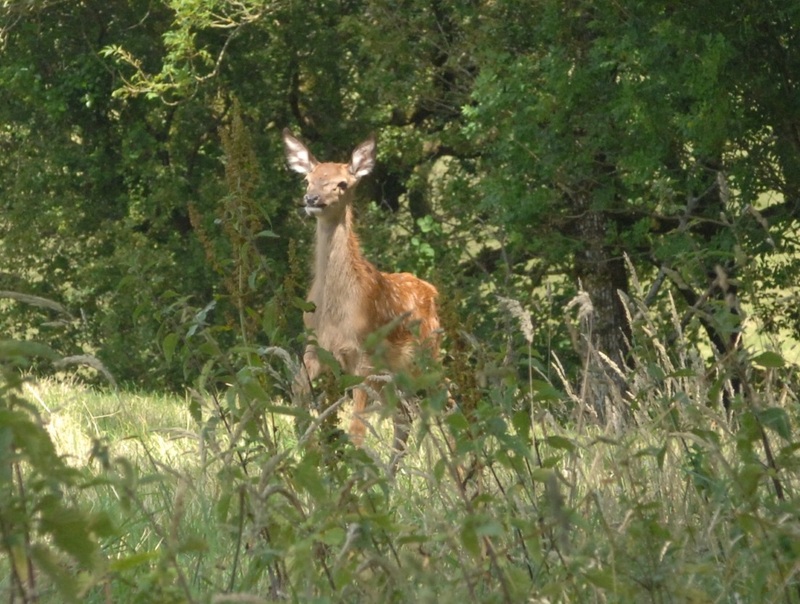 The photograph above is of a red deer calf that had temporarily lost its Mum. I first heard it plaintively calling, then when it saw movement it came running up towards me. When my puppy, Rufus – then only about 12 weeks old, spotted it he thought it was some kind of enormous dog, and came belting back to hide behind my legs. At this, the calf realised that I wasn’t what it was looking for, and it dashed off into the nearby woods. Luckily, I had my camera with me, and was able to grab a snap before it disappeared. This image gives a flavour of just one instant in one of the most beautiful parts of the world – mid-Devon. There are several accounts of my hunting sessions available via the links above- I hope you enjoy them!